That's all it takes for you to say 'thank you' for the articles you find useful! Use the buttons above to show us your love, we know you want to! American English is a resource center for teaching and learning about American English language and culture. This website provides a variety of engaging materials and resources for teachers' professional development and for students in the classroom. Both teachers and students will find new ways to practice English and learn more about the United States. Created by the Office of English Language Programs in Washington, D.C., these resources are designed with English as a Foreign Language Teachers in mind. Not only are there materials available, but also training programs and distance education courses. Teachers working abroad will find this to be one of the most important resources to familiarize themselves with during their time out of the country. There is a wonderful “English Teaching Forum” that contains articles from the Quarterly Journal Office of English Language Programs. It’s easy to search for particular interests, and users will find a multitude of information on pedagogical topics like integrated skills, materials development, reflective teaching, assessment, teacher-training, and curriculum design and skills-based topics including vocabulary, spelling, language awareness, critical thinking, and reading, writing, listening, and speaking. The Forum can be found here. The most innovative and unique content on this site is something called the Trace Effects Game. I can’t wait to try this with my students. The American English website describes the game as “an innovative language learning video game that will complement students’ classroom English language instruction through interactive 3-D multimedia learning adventures. Trace Effects is geared for players aged 12-16.” Teachers working with middle school or secondary student domestically or abroad will find that this clever game engages students and makes learning fun. Even though its designed for a younger audience, college students in the ESL of EFL classroom may also enjoy it. Here’s how it works: “Gamers interact and solve puzzles in a virtual world filled with diverse English-speaking characters. In the game, students take a dynamic journey through the United States, traveling to cultural locations like Kansas, New Orleans, the Grand Canyon, New York City, San Francisco, and Washington, D.C.” Trace is the main character. “He is a university student from the year 2045 who has accidentally traveled back in time to the present. In order to get home, he must complete a challenging mission to change the future for the better by helping six different young people accomplish great things and have a positive impact on the future.” What’s especially brilliant about the game is that not only is it a fun way for students to acquire language, but it also addresses a number of other important themes relevant to American culture and society like entrepreneurship, community activism, empowering women, science and innovation, environmental conservation, and conflict resolution. The “Resources” section of the American English website is divided into three clear categories: learners, teachers, cultural resources. In other words, both students and instructors can find helpful materials here. There are professional development opportunities, classroom lessons and materials, videos, and wonderful cultural resources, especially geared towards English Language learners. Another neat feature attached to the Resources section is the “My Resources List” function. Users can save favorites and send them to an email address to make it easy to find them again. I know that for me, this is a life-saver, as I often visit a site, find something I’d like to use, only to lose it in Cyber space forever if I’m not careful. The “AE Community” is a place for English language teachers to gather and exchange ideas. Instructors can exchange stories, and swap resources. It’s a wonderful networking site for new and experienced teachers, alike. There is also access to the Online English Teaching Forum magazine and a plethora of downloads. Learners can post stories about their experiences, which is an invaluable perspective for teachers to access. Lastly, there is information about events and jobs. The official nature of the site bodes well for ensuring quality content. The United States government has a vested interest in ensuring that teachers who are working abroad are well-prepared and well-informed. This also means that the site itself is impeccable and extremely professional, creating an unparalleled user experience. This game is a cutting-edge way to engage English Language Learners with their language learning experience. This is one of the most creative and large-scale tools I’ve seen produced. It truly challenges our old notions of how to teach and allows teachers to incorporate technology into the classroom in ways we haven’t seen before. This is a fabulous place to reach out to other teachers. So often, EFL teachers abroad, especially those who have received limited training prior to leaving the country for teaching assignments really rely on the advice and insight of other professionals. This is a fabulous place to get new ideas, challenge old perspectives, and stay current on best practices. It’s also a great place to find ways to connect in-person, as a number of events are posted for teachers in many areas. It’s difficult to be critical of this site, as it truly is the best resource out there for English language professionals in many ways, but if I had to choose a Con, I’d say that I would like to see more direct practice opportunities for students on the site. That’s not to say that these materials aren’t available, but the content for students doesn’t match that which is available for students. 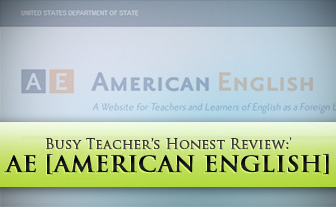 Every English as a Second Language or English as a Foreign Language professional needs to visit the American English site. This is clearly a resource with the necessary funding to be best in-class. Teachers will find a wealth of information in the Forum, the AE community, and under the Resources section. I hope that many of you will try the Trace Effects game in your classrooms; I know that I hope to do so in the fall with my own students. If anyone has already attempted to use this game, it would be great to hear how it’s going. I’d also like to know more about user experiences on this site, particularly from teachers who are working in other countries. This is a guest review by an independent author. This review reflects the opinions of the author and not necessarily those of BusyTeacher.org as a publication. We post stuff just like this every day on Facebook. Like us. You won't regret it.